Fire Siege Fortress Slot Review | Action-filled NetEnt game! 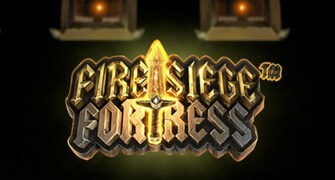 In September 2018 Net Ent jumped into the medieval theme with the release of Fire Siege Fortress. This dark but beautifully animated online slot machine is of the high-quality Net Ent is known for. The gaming action takes place in a castle protected by a fortress that has come under siege. Players will notice that on the left side of the reels a knight is standing at attention. He is guarding the fortress and watching the reels spin. The mood of the game is set by the sounds made by armour and weapons. These accompany the spinning of the reels and the sound of winning combinations. Every symbol seen on the reels fits the medieval theme. This even includes the standard Aces and 10s. Other symbols used include a dragon, the knight, his sword, battle hammer and war ax. The wild symbol is the letter “W” adorned with gold tile. The scatter symbol is a gold-tiled king’s crown. The second, third and fourth reels have windows attached on the bottom. Every time the reels are spun these windows are active. Getting the wild symbol in at least a single window leads to modifiers being applied. Those modifiers held determine how much money a player wins. If the reel two window has a wild symbol it begins the Archer Attack bonus. A pair of archer snipers then releases arrows to the reels. They land in three positions on the reels, entirely at random. They will never land on a scatter or wild symbol. The symbols hit by the arrows then become wilds. There is also a reward given when a wild symbol lands on reel three’s window. This is called the Dragon’s Breath. The dragon will appear and sets the reel on fire, which makes the entire thing wild. Reel four’s window also rewards players when a wild symbol lands there. The reward is called a Trebuchet Assault. It sends the Trebuchet tribe in to throw a ball or two onto the reels. The symbols they land on then expand, potentially creating larger winning combinations. These three wild modifiers can appear separately or together. Activating Trebuchet and Dragon’s Breath together creates a single oversized wild symbol. At most, players get an additional eight wilds on the reels. Players can trigger free spins by getting the scatter symbol on the reeks three times at once. They may win as many as 18 spins for free. However, even a single scatter on the reels benefits players. This gives them three free spins for their single scatter symbol. If they get a scatter in the reels’ towers, six free spins are awarded. Two scatter symbols can get players three Fire free spins if they land in a reels’ tower. 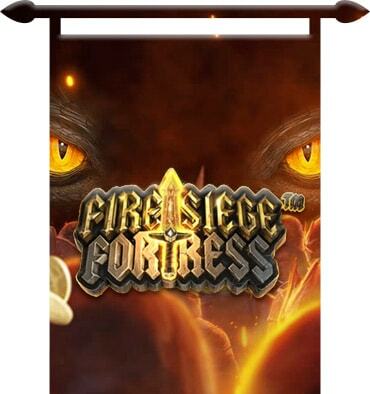 Fire Siege Fortress takes a common theme and puts a twist on it. The unique bonus features will no doubt help this game stand out from many others.